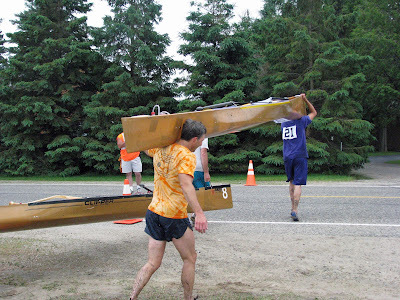 Today was the Blackwater Barge Canoe Race in Cohasset, Minnesota. The race wasn’t scheduled until 1:45 pm. 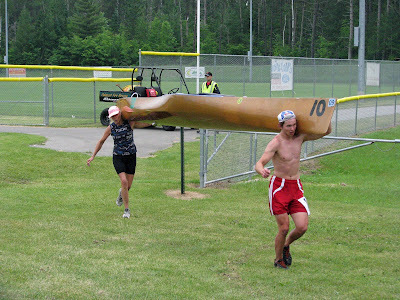 This is a later start than most of the other canoe races. I was staying at my father’s place on Pokegama Lake not too far away. I was up early and just hung around the house until I left for Portage Park where the race would start and the festival was being held around 1130 hours. I had to go the long way around to Cohasset from my fathers place because of road construction on Hwy. 17. I needed to stop into The Home Depot anyways for some batteries than I would need later for our scheduled night paddle on the Mississippi River. Al Rudquist was already at the festival when I arrived. We would be racing together today. We went up to register and got our free t-shirt. 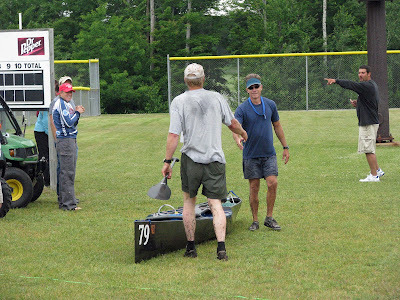 There was still plenty of time before the race so I talked with some of the other racers before getting my canoe off my Suburban. I also watched the short parade where candy was being thrown to the children who watching the parade. It looked like Halloween with the children with all their goodies that they collected! It’s a shame that more racers wouldn’t be attending this race since there were three other races scheduled for today in Minnesota and Wisconsin. I know of some other racers who were attending the other races today so there wouldn’t be that many people racing in the Pro class here in Cohasset. There was also a recreational class that would do one lap and they start on the water. The Pro’s would do two laps. They do a LeMans start and there’s a longer portage between the two laps. Al Rudquist assigned the start order for the LeMans start. If I remember correctly there were six canoes in the Pro class. There was Al and me; Fred Rayman and Ed Arenz; Io Harberts and Cory Meyer; Joe Dunaisky and ?? ; Dan Shaffer and ? ?, Keith Canny and Lee Jarpey. We were all assigned our order of placement by Al Rudquist and we all lined up single file. Al and I were the last ones in line. 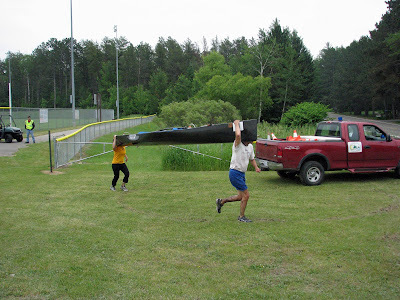 When the signal was given for the start of the Pro class everyone grabbed their canoe that was on the ground and we all started running down the street before making a sharp right turn down the boat launch to the river that’s probably 10 feet wide. When Al and I got to the water there was just a small opening. Al ran into the water with me following. We had a smooth start and we were the third ones to start paddling. The course begins by paddling out and around an island then we head back around a buoy near where we launched our canoes. We rounded the island first and back to the buoy. After the buoy turn we decided to have a sociable first lap and we let the two other canoes catch up to us. These two canoes were Io and Corey and Ed and Fred. 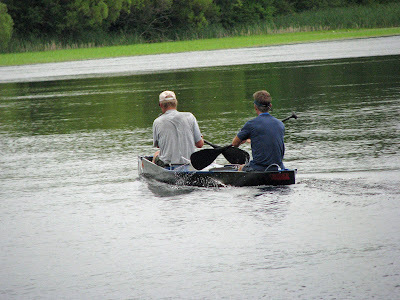 When we all approached the portage through the cattails and other vegetation, Al and I made it in first. Al got out first and began pulling the canoe a head before I jumped out. I was hoping I wouldn’t sink too far in the muck. 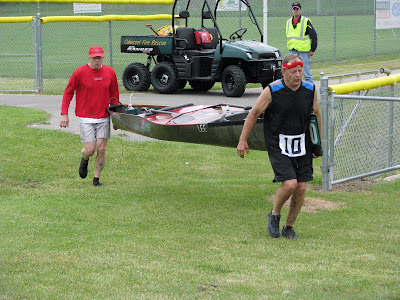 The portage begins with a short run before we have to go up a steep, short incline before running through the Portage Park complex, across the road, then down the boat landing before getting to the lake. The second lap was like the first one. Up around the island and back to the buoy before making the long circle back to the Mississippi River. After we rounded the island we could see that we had a sizeable lead over the second place canoe of Io and Corey. Way behind then were Ed and Fred. 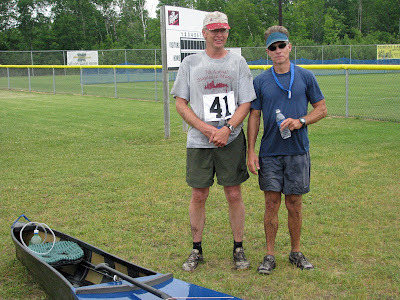 Something must have happened to them because all three of us approached the first portage together. Al and I did a steady paddle back to the portage off the Mississippi River. This time we only had to run about 100 yards before the finish line. We finished the course a couple seconds over one hour and twenty-nine minutes. I believe it was 1:29:04. Io and Corey came in second followed by Ed and Fred in third. I noticed that Ed couldn’t run. 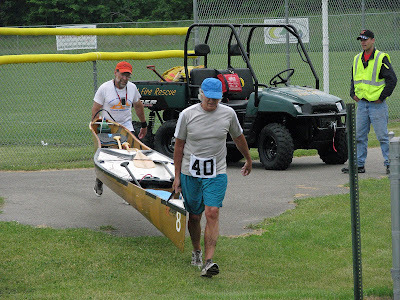 Ed told me later he had pulled a muscle in his calf on his second step during the first portage. 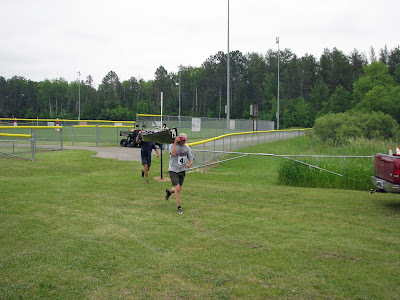 I watched as Ed hobbled across the finish line with Fred behind him. I don’t have the race results at this time but I hope to have them soon. I will post them if I get them. I hope more people attend this race in the future. The organizers treat everyone very well. Besides giving out cash prizes and trophies to the winners they provided a meal to everyone who attended the festival. The one sight I wish everyone could have seen was when Micki Rayman was paddling with her three young nieces. 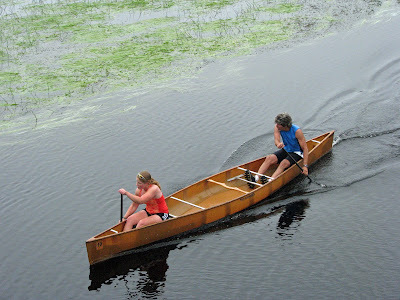 They were all in a recreational canoe with the two smaller ones in make shift seats in the middle of the canoe. The start of the recreational class had begun and I could hear Micki call, Hut!, and the young girls would all switch sides in unison. The two middle girls had to raise their paddles high over the head of their sisters in front of them. 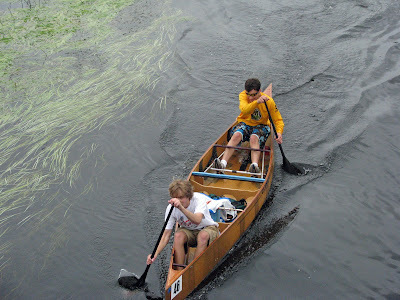 Once they got the paddle to the water they began a very quick stroke rate. They appeared to be having a blast! Several of us, including Al Rudquist, talked about this week-ends lack of participation of the racers and we decided next year to promote the race better by letting people know that theirs going to be more paddling than just the race. 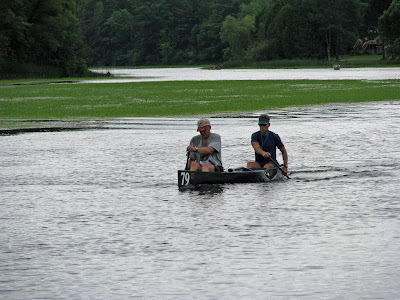 We decided to make this week-end a paddling week-end. 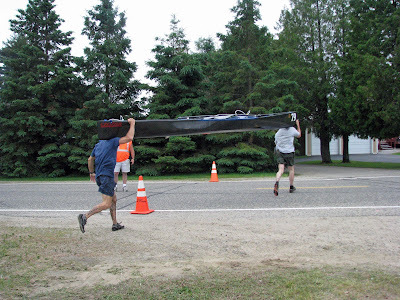 In addition to the race on Saturday we would schedule a night paddle for Saturday night and a day light paddle on Sunday to make the trip worth while for those who drive a distance to Grand Rapids. I want to thank my step-mother, Donna Ryan, for providing the photos so that I could post them on my blog. She also took a short video before the batteries ran out. When I have time I may see how to post it on You Tube and provide a link to it. Thanks for the post. It is good to have one place where we can see updates on the races that are taking place. 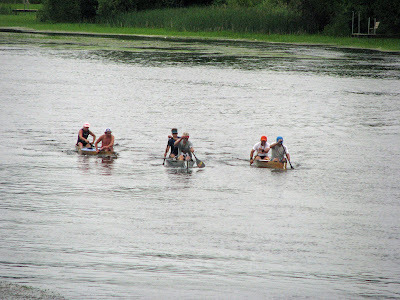 Are you familiar with the longest non-stop paddle race, the Missouri River 340? Be sure to check out www.rivermiles.com for info. We had 150 boats in the race last year and the director is hoping to increase the limit to 200 for 2009. It's scheduled for Aug. 4-7 beginning in Kansas City and ending in St. Louis.